You probably know that Google is by far the largest search engine, generating much more inquiries than all other platforms combined. As a matter of fact, it takes over 90% of the total market share, well above the likes of Bing, Yahoo, and Baidu. But do you know that Google processes over 40 thousand search query every second, which translates to over 3.5 billion searches per day and 1.2 trillion searches per year worldwide? Probably not! Google obviously gives users a plethora of incredible possibilities that make the platform so popular. Most people are aware of features such as keyword suggestions, people also ask, maps, and translations, but there is so much more to discover here. Keep reading to find out 10 amazing Google tricks and secrets. We begin with a simple but very useful trick. Namely, you can narrow down the search to look for specific phrases instead of the keywords. This will help you to find the sources you need more quickly, reducing time-waste to the minimum. The only thing you need to do is to write the phrase between quotes and run the search. 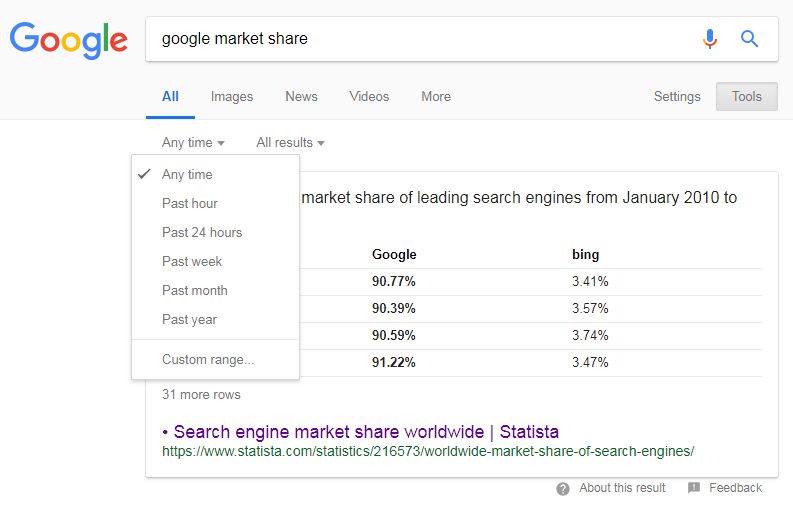 For instance, you can look for “Google market share” and it will display only the content that contains that exact phrase. This is another useful feature, but highly underused. Google offers you a number of possibilities to customize searches, including timing preferences. With this tool, you can focus on certain periods instead of the all-time results. The same goes for image searches, where you can modify results according to the preferences such as types, colors, sizes, or usage rights. Let’s say you like the way a certain website works, but want to expand your area of interest and find similar online sources. In such circumstances, Google can help you to get the job done more efficiently. The process is simple – you just need to insert “related:” in the search box and then enter the name of the website. 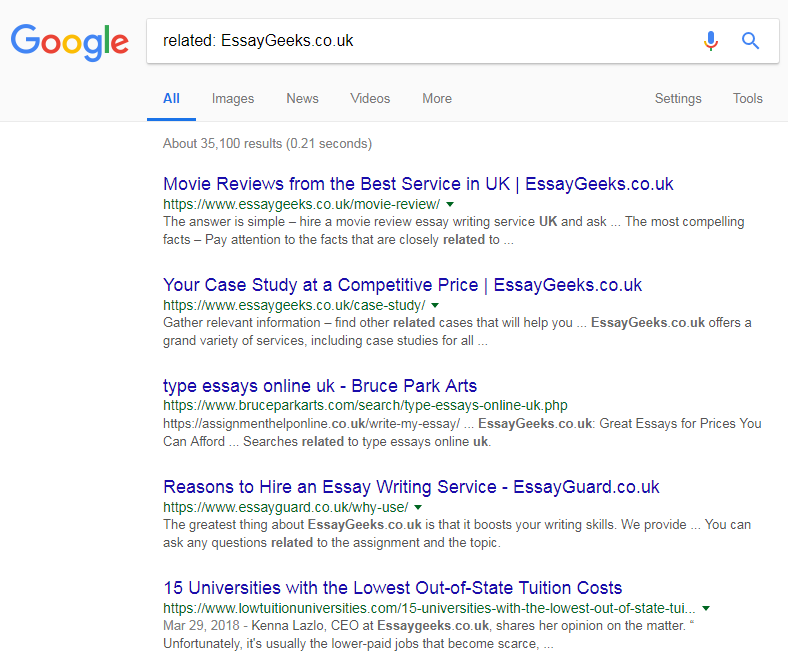 For example, you could be looking for websites similar to EssayGeeks.co.uk. In this case, you just need to enter related: EssayGeeks.co.uk and initiate the search. Search engine optimization largely depends on your backlink strategy, so it would be great to know which websites link to your own. As always, Google offers you a practical solution to the problem. You need to type in “link:” before adding a website domain. Here’s an example of the Grammarly search that displays all of the URLs leading to the targeted website. Sometimes you want to search items by location because it helps you to reach physical objects easily. If you don’t know the exact place, but rather want to check out different options, use Google to search by locations. We looked for gym and fitness 90004 to see the list of workout places in Los Angeles, California. What seems like a random stream of numbers at the end of the search phrase is actually a postal code. Therefore, you can use Google to discover stores, shops, or any other place of interest. Minus: If you want to remove something from the search, add minus (-) to eliminate unnecessary results. Asterisk: If you remember only a part of the search phrase, use an asterisk (*) to replace the unknown words and find all search results that match the familiar keywords – just like in our Life example. If you want to narrow down the search completely, you can look for content within one site alone. But there is no need to go to this site directly as Google gives you the opportunity to explore it instantly. Simply enter “site:” and the desired keywords. It looks like this: customer service site: hubspot.com. 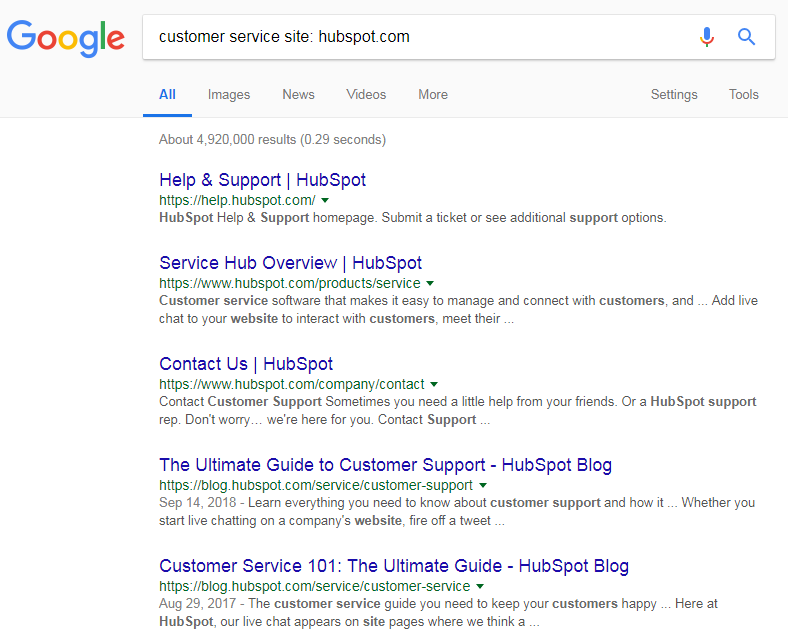 Google displays all Hubspot customer service-related posts this way. Now that you’ve seen some practical search-related tricks, it is time to check out a few interesting Google features. Did you know that Google can precisely calculate the appropriate tip for your restaurant bill? 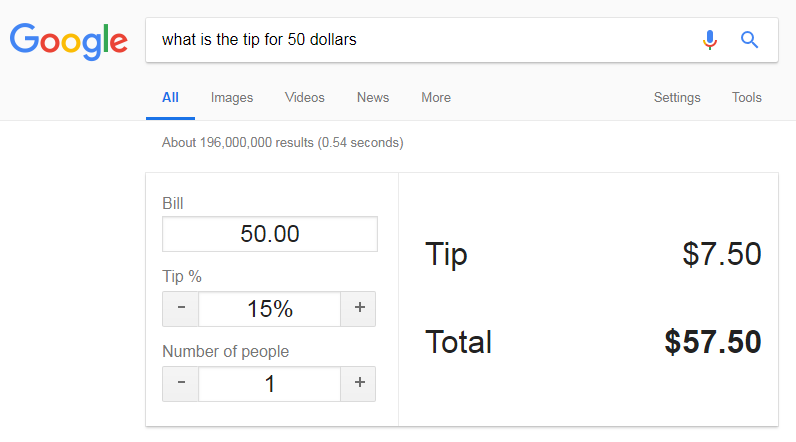 The process is very simple – ask the question like What is the tip for 50 dollars, and Google will give you the answer immediately. Sometimes you just want to relax and have fun with your friends or colleagues, but don’t know what to do about it. Google gives you an interesting solution in the form of the “blink HTML” function. Lose the quotes and search for blink HTML using Google. This feature is definitely not very useful, but it can serve as your way to fool around with friends by making them confused or curious. After all, everybody wants to have fun from time to time. Talking about fun and entertainment, the Google Space function is yet another trick to help you waste time. The feature is simple – enter Google Space in the search box and follow the first link you see. It will take you and your friends to the zero-gravity environment and enable you to see what it’s like to spend some time in the digital weightlessness. Google is a well-known global phenomenon that generates billions of user searches on a daily basis. However, most people use it for simple searches and don’t know that the platform offers a whole bunch of incredible possibilities. We picked the 10 most impressive Google tricks here, so don’t hesitate to use them and make your inquiries much more interesting. Jennifer Sanders has been working as an editor and a copywriter at a journalistic company in London for 3 years. She is also a professional content writer in such topics as inspiration, productivity, education, and technologies. 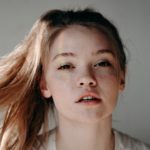 Feel free to connect with her Twitter or Facebook.